With our Blue Boat guide app you can listen to our audio guides on your own mobile device. The general story is available in 21 languages! 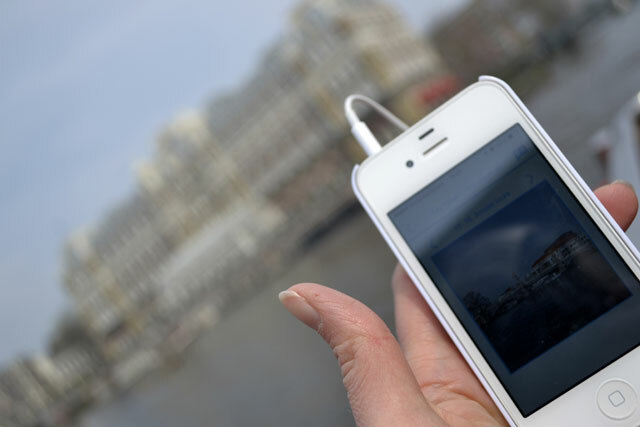 We also offer you a selection of exclusive, themed audio guides in the app, like the Kids Cruise and the Rembrandt Cruise, produced exclusively for us by the Rijks Museum. The guide app also has the added feature of displaying photo’s and images for you while you listen to the audio story. On what devices can I use the Guide app? The app is available for Aplle & Android phones. The app does NOT need a3G (4G) or wifi connection to work. So feel free to turn it off if you do not want to have any mobile data use! However, wifi has to be turned on for the app to work properly! Through one of the links on the right hand side top of the page. If you did not manage to download the app at home, you can download it at our dock using our FREE wifi! Using the app is very easy: it starts automatically when the boat starts cruising. If, for any reason, you might have closed the app during the cruise, you can use the “Skip Forward” button to skip make the app search for the next audio point. To switch languages mid-cruise use this button. The next audio item will play in the newly selected language.